To my loyal readers, I am sorry for the long delay in posts. In the past month, I have been in DC, Paris, Boston and Atlanta. I do have to say that the mini Beta Phi reunion was a great time. I'm now back in NYC and up to my old tricks. I will fill you in about my trips (there are some great highlights) as my schedule gets back to normal, but for now I will tell you about my dinner with the Georgia Peach. As you know, I see the Georgia Peach on a regular basis, but haven't seen her in ages due to my schedule. We were supposed to go to Little Owl, but it seems they are closed for renovations until later this week, thanks for the alert via twitter, so we went to plan B, Risotteria. This place is exactly what you'd imagine it would be, a restaurant that specializes in risotto. I had been there a long time ago, when they first opened, but I think after 10+ years, I can consider this my first time. For those with food issues, everything here is rice based so it's gluten free, and the menu is coded for dairy and vegetarian options as well. They don't take reservations and seating for only about 20, but if there is a wait, there is no shortage of places to grab a drink while you wait, it's on Bleecker Street. 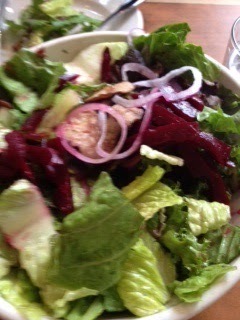 We started with a romaine lettuce salad with beets, shiitake mushrooms, onions, and truffle oil with a Chianti dressing. The salad was clean tasting and very refreshing. A perfect start knowing that next up was risotto. For dinner, the Georgia Peach got the parsley and truffle oil risotto. 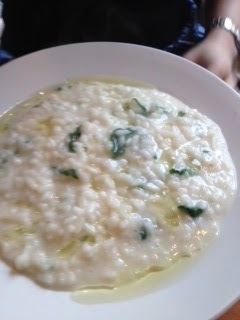 Which was creamy goodness with truffle oil and the freshness of the parsley. When I tasted hers, I was a little jealous. I had the asparagus and safron. This was creamy and satisfying without being too heavy. It's a great alternative to a bowl of pasta. I enjoy a good risotto and order it out because I know risotto can be time consuming to cook, now that I've been back to Risotteria, I know how easy it is to head to the West Village and order up any type I want. And of course, spending an evening with the Georgia Peach is worth the trip to any part of the city (and maybe NJ).